Chris checks out a couple of Diablo III announcements that Blizzard hopes will stoke the hell-fires of Sanctuary for the foreseeable future. BlizzCon 2016 was a celebration of Blizzard's history as well as its future, and one of its major milestones was the 20th anniversary of the Diablo franchise. There are not many gaming properties that are active – let alone relevant and hugely popular – after two decades, but Blizzard's isometric RPG is one of them. 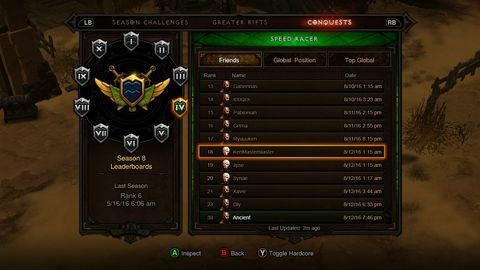 Diablo III got off to a shaky start, but four years and multiple patches and overhauls down the road, it's stronger than ever, thriving in today's competitive marketplace. At BlizzCon, there were two major pieces of Diablo III news: one of series' most iconic characters is returning in the Rise of the Necromancer character pack, and anniversary event The Darkening of Tristram was announced. The Darkening of Tristram is due to release in January 2017, and is a re-imagining of the original Diablo in Diablo 3 itself. All 16 levels from the 1996 classic have been recreated by the team, and the game's four bosses have also been remade – including the gluttonous Butcher, and a retro reskin of the titular Lord of Terror himself. What started out as a small nod to the original game ended up being a lot bigger and more expansive. As senior designer Joe Shely told me, what started as an idea to add the original music to the game became something so much bigger and much cooler. "We thought that it would be cool to add some of the things from Diablo 1 to the game – something special for the 20th anniversary," he said. "As we started to build it, we just kept adding more and more of Diablo 1 to the game, and it just became where we ended up now, where we have essentially the whole game. All 16 floors and the four bosses and the mechanics are very close to what they were in Diablo 1." The team has fully committed to the idea recreating the Diablo 1 experience as best they can. A pixilation filter has been added to give the impression that the game is running at a much lower resolution, and there have been a number of cosmetic changes, all aimed at capturing the feel of the old game. These include an eight-way direction limit, a new retro UI, and much choppier animations. 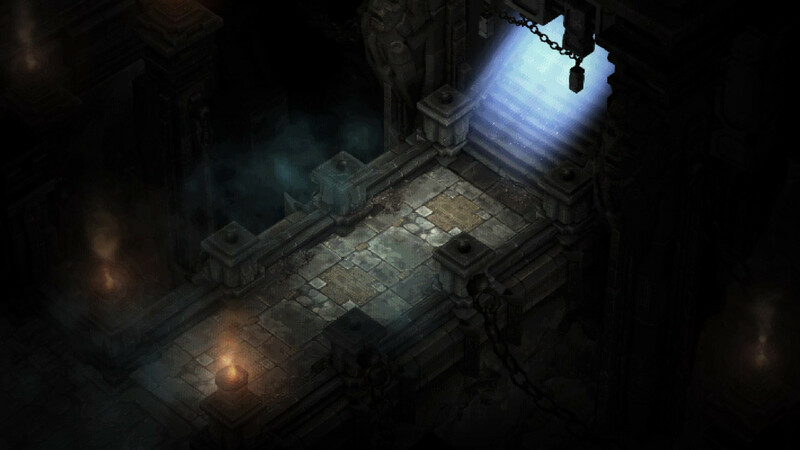 As a result, The Darkening of Tristram looks and feels very different from Diablo 3. The few hours I spent in the event were a lot of fun, but there is a real potential for disappointment, and players will need to approach the content with the right mindset to avoid it. The retro-ising of the game can feel limiting and may be off-putting – especially for those who have not roamed around inside older Diablo games. Console players in particular may find the movement limitations awkward when they first enter the Cathedral. As for the core game experience, it's currently a bit hit and miss. The big successes are the music and the general feel of the game: it's a massive nostalgia hit and rather amusing to watch your toon electric shuffle about the place. The problems arise in that while all of the original levels have been remade, all the assets and monsters are from Diablo III – there do not seem to be many – if any – reworked Diablo 1 monsters or tile sets. I also have concerns that the amount of content in the event will be smaller than what people expect. In its current pre-release state, it does feel rather short. That being said, it is a cool concept, and those that have been fans of Diablo for the past couple of decades should find a fair bit of fun here early in the new year. There are some cool items to be found, and the new but old presentation is oddly satisfying. It's a novel idea and something I hope the team can expand on in the future. As it contains one of the most beloved classes in Diablo II, the Rise of the Necromancer character pack was met with a lot of enthusiasm on the BlizzCon floor and at the subsequent Diablo events during the convention. There were concerns and questions, however – mostly about how the class will differentiate itself from the Witch Doctor that already fills the pet-heavy playstyle the Necromancer was known for. Also high on the list were questions around how "true" it would remain to its initial incarnation. "It's super important that much of what people know and love about the Necromancer before should be there," said senior artist John Mueller. "If it wasn't, then what would be the point of even calling it that? If we were going to change it significantly we would call it a different name… Keeping the character as close to what people love was super important to us," he added. "You can see this with the armour sets we've shown, and the skill we've tackled first. That's all to really communicate that there is going to be a really strong grounding in that new class that is based on the original class. This is a re-imagining of the original Necromancer class, and I think anyone that knows the class will see that as soon as they begin to play with it." Unlike the other classes in the game, Diablo III's Necromancer maintains the truly dark gothic aesthetic from the earlier games. There's also a female Necromancer, and in many ways she's even creepier than her male counterpart. What is most striking, however, is how the new Necromancer plays: it feels like the Diablo II class with some nice additions. The Witch Doctor has pilfered a skill or two from the Necromancer, and some crossover remains, but the Necromancer distinguishes itself in Diablo III with the way it uses pets. 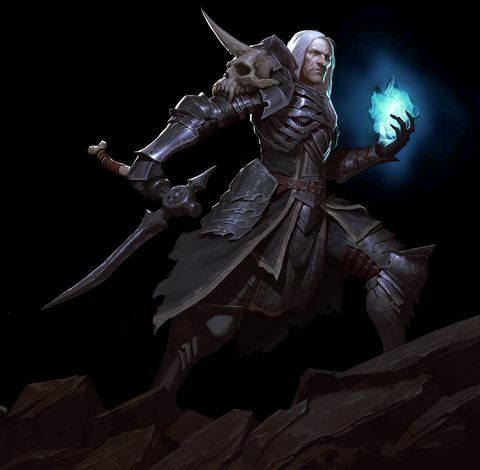 While the original Necromancer pets are passive – you summon them and they do their own thing – the new Necromancer has what the team call Active Passives, which turn it into a commander of the dead, able to directly control your skeletons or golems. They will attack on their own, but you can make them attack a specific enemy. "This is going to create a more interactive experience that other classes do not have," said Mueller, and indeed, this proved to be the case when I went hands-on. 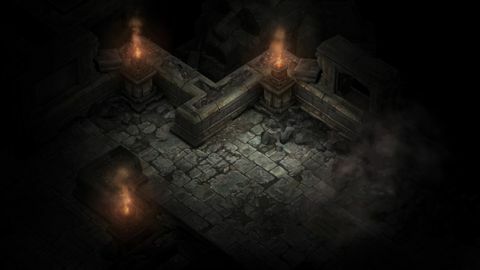 The offensive and defensive options available to the class are extensive, and being able to harry or target enemies with your pets gives you more space to use your other offensive skills, many of which will be immediately familiar to Diablo II players and include Explode Corpse, Bone Spear, and Decrepify. Playing the Necromancer was pure fun – even in its unfinished state – and is a great example of how a developer can take something old and make it new without losing what made it special in the first place. Building your army of undead and unleashing them on packs or Elite units is not only fun, but tactically satisfying. You can also use them to herd monsters, directing them to places on the screen where you can explode a corpse for massive damage, or just so you have time to heal or target a long-range enemy. For the first time in Diablo III, there is a class that can effectively keep itself consistently out of melee range and control the conflict. It's a brand new experience, and possibly the most interesting addition to the core game thus far. For some, these Diablo announcements were not what they were hoping for, but there is still a lot to look forward to. The team is clearly committed to the game for the long haul, and other updates planned for 2017 will add more features and quality of life improvements. This is a team the truly feels like it is looking to the future for the series, even if sometimes their inspiration is found by looking back.